Promising at long last to reveal the location of the pot of gold where he was born, Ed Sheeran has announced plans to move forward with a biopic of his life. In a new interview in Q, the guy who wrote that song at the end of The Desolation Of Smaug has said he’s currently in talks to make the film, and then immediately makes it weird by comparing it to 8 Mile, which is sort of like saying the biopic about Wayne Gretzky will be akin to Straight Outta Compton. But he quickly tempers it by fusing it with just about the most watered-down, British, middle of the road entertainment imaginable, just so you don’t forget who he’s talking about. “I want to have an 8 Mile moment but 8 Mile meets Notting Hill,” he says, presumably while eating a crumpet and tut-tutting about the latest cricket results. “Not gritty like Detroit but, like, Ipswich. I’ve got loads of songs about Ipswich that haven’t come out so I could make a soundtrack.” Indeed, it may finally be time for the world to truly understand the gritty, hard-knock world of Ipswich, as recounted by the son of an art curator and jewelry designer. 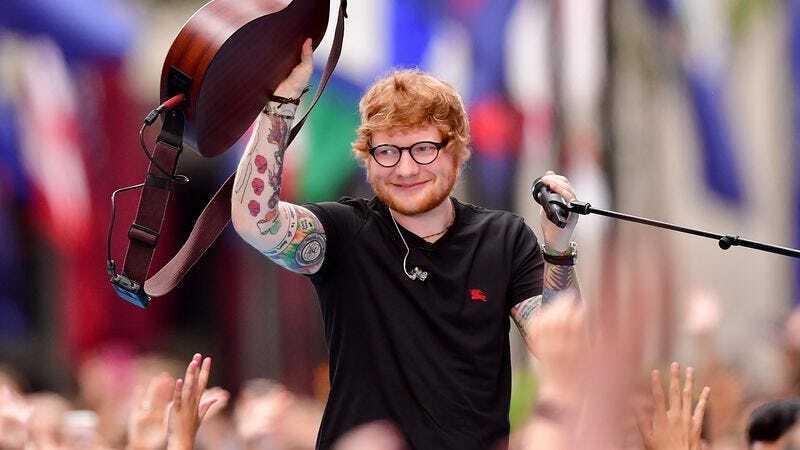 He first revealed this plan back in March, when Sheeran revealed he was, “in talks with one filmmaker that I really love,” but this is further confirmation the biopic is actually happening. After all, he’s just a boy, standing in front of a major media publication, telling it he’s basically like Eminem, if Eminem was reduced to acting befuddled while Julia Roberts stared at him, and also wasn’t anything like a rapper from Detroit.